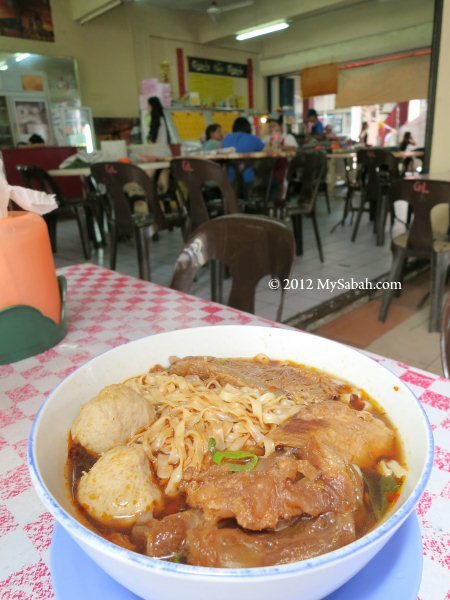 Do remember the name Ngiu Chap, if you want to have “a taste of Sabah”. 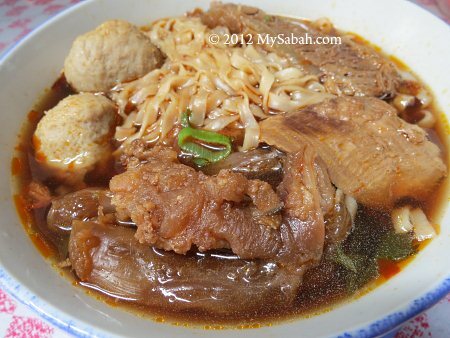 Literally Ngiu Chap means “Mixed Beef” (牛什 or 牛杂 in Chinese), which is a mix of beef slices, tendon, tripe, meat ball, liver and tongue cooked in yummy beef broth. 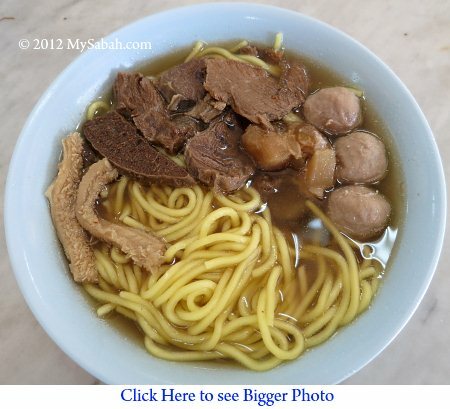 Usually we eat it with Mee (yellow noodle) or Mee Hoon (rice noodle). 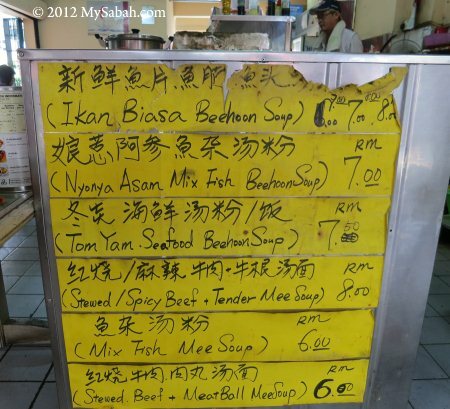 There are many Sabah restaurants serving Ngiu Chap. 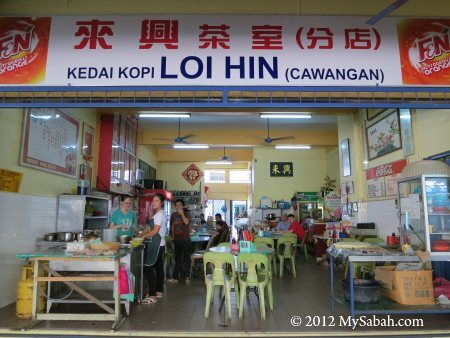 Personally I recommend Kedai Kopi Loi Hin (來興茶室 in Chinese) in Donggongon town, about 10 KM away from Kota Kinabalu city (KK). 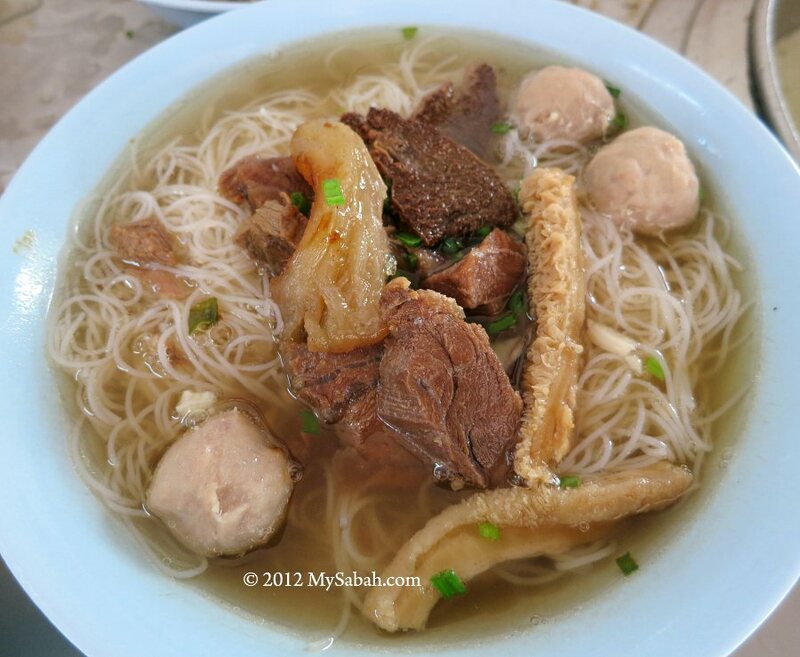 Loi Hin has been making one of the best Ngiu Chap in Sabah for over 40 years. 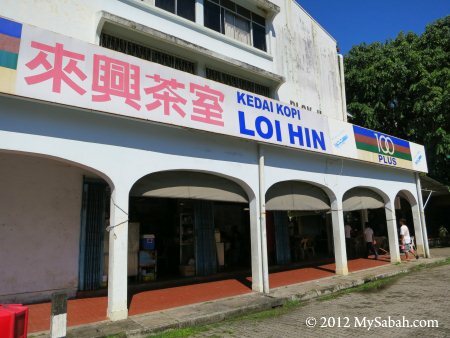 Pic: Kedai Kopi Loi Hin (來興茶室), “Kedai Kopi” means Coffee Shop. Loi Hin is open from 7am to 3pm daily, and it’s always full during meal time. Pic: Ngiu Chap served in different style. 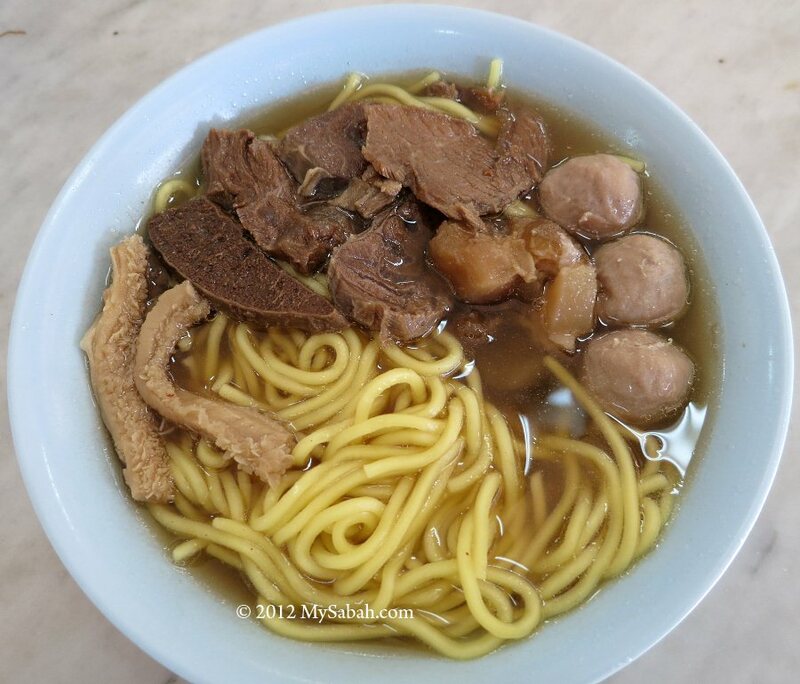 Most people order Ngiu Chap Mee (yellow noodle in beef soup, 牛杂面 in Chinese). 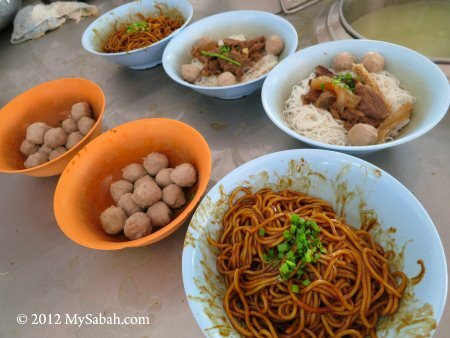 Each bowl costs about RM6 to RM6.50 (≈USD2 to 2.17), RM8 or RM8.50 (≈USD2.70 to 2.80) if you request “ka-liau” (extra meat). *Prices as of Nov 2012. 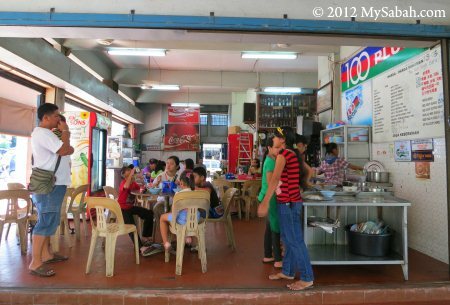 Loi Hin is a typical Chinese coffee shop. 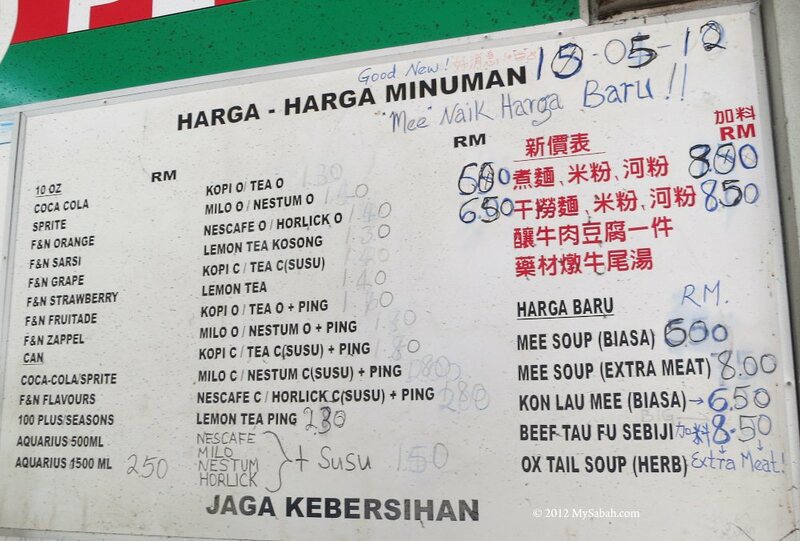 Besides Ngiu Chap, you can order hot and soft drink such as coffee and tea here. As always, it’s delicious, with tangy aroma of beef, and the meat is fresh. The spleen tastes a bit raw and fishy though. The hot soup is the best part, it’s thick, as if they cook the whole cow in soup (just kidding). Usually I take one or two spoons of soup to excite my taste buds before eating. 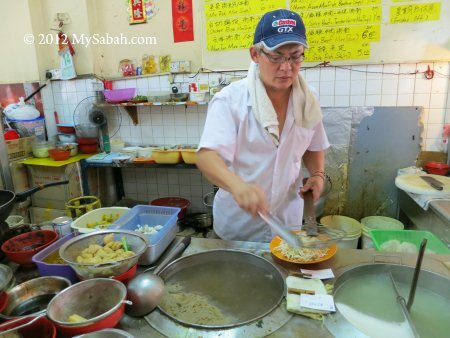 You also can ask them to serve Mee Fong (white rice noodle, 牛杂米粉 in Chinese). The rice noodle is thinner and taste less oily. By default, the noodle is served in soup. 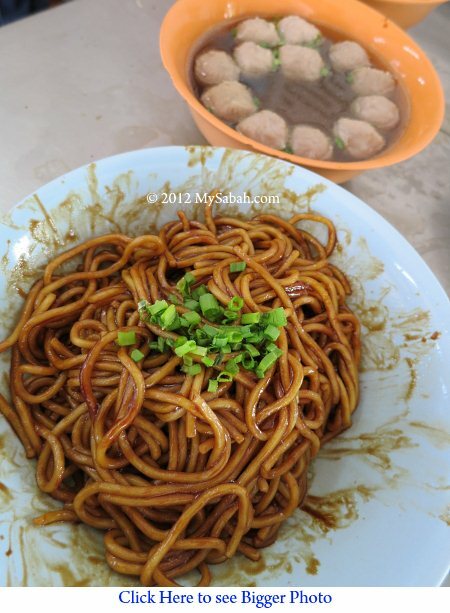 Order Kon Lau (dry noodle style, 干捞 in Chinese) if you prefer the Ngiu Chap soup served in separate bowl. Address: Block H, Lot 8, Ground Floor, Donggongon New Tonwship, Penampang, Kota Kinabalu, Sabah, Malaysia. 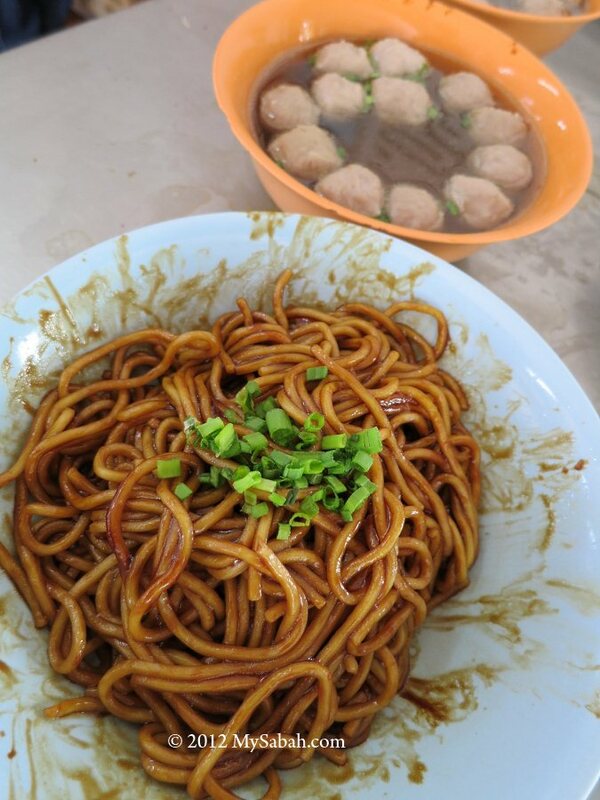 Loi Hin has 3 branches in KK, opened by the sister and brother of the owner, Mr. Yong (杨寿兴), at Donggogon, Foh Shang (behind Millimewa supermarket) and Inanam (also behind Millimewa supermarket). Pic: the Donggogon branch is less than 50 Meters away from the main shop. Update (Sep 2013): This restaurant is closed and the owner has moved to Papar town doing other business. 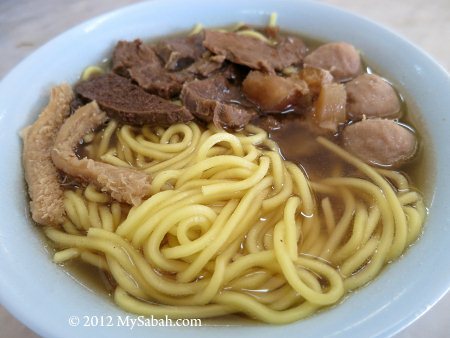 Beef Noodle (Ngiu Chap or Ngau Chap) is a signature dish of Sabah, so I’m always on the quest looking for the best Ngiu Chap. Sometimes I’m surprised that good food is just nearby. 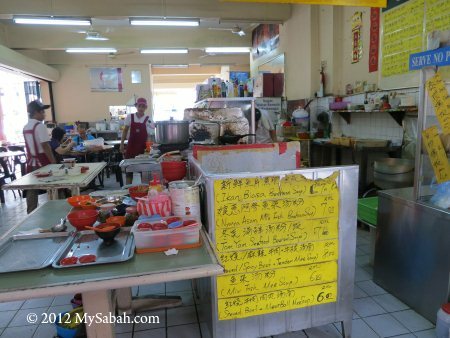 For example, I found very special Ngiu Chap at Damai Plaza (Kota Kinabalu), which was not far from my office. 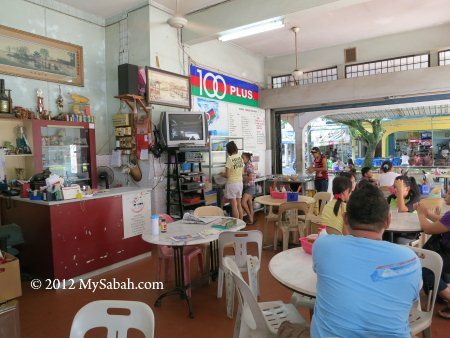 Since then, I visited Kedai Kopi Good Luck Restaurant (Chinese Name: 澔運茶餐室) regularly. 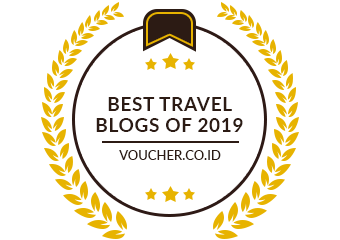 Address: Block F, Ground Floor, No. 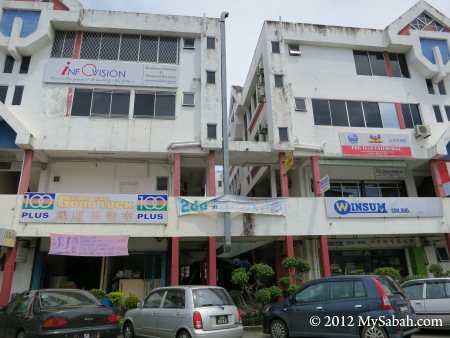 32, Damai Plaza, Phase IV, Luyang, Kota Kinabalu, Sabah, Malaysia. Pic: The spicy beef noodle with tendon (Chinese Name: 麻辣牛肉面) is my favorite. 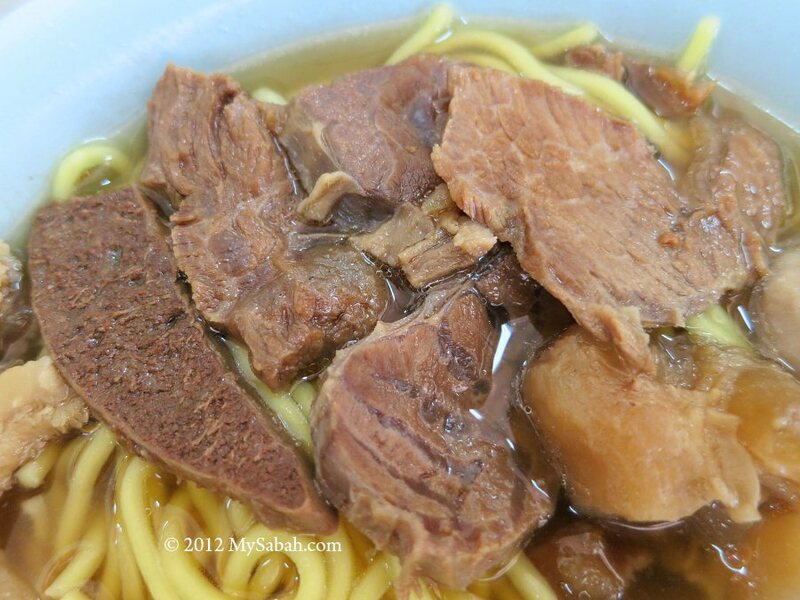 The beef soup is delicious, and the handmade flat noodle is smooth and springy. 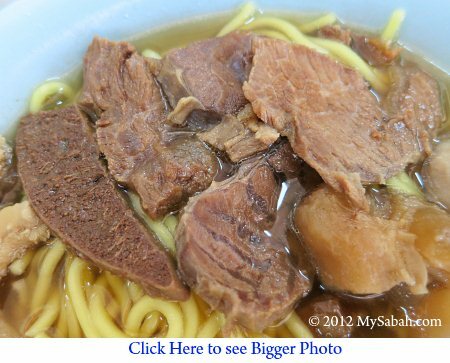 Look at the big beef slices, tendon and meat balls, your every bite will be a mouthful of beef and noodle. You can choose 3 levels of hotness, i.e., little, mild and super hot. 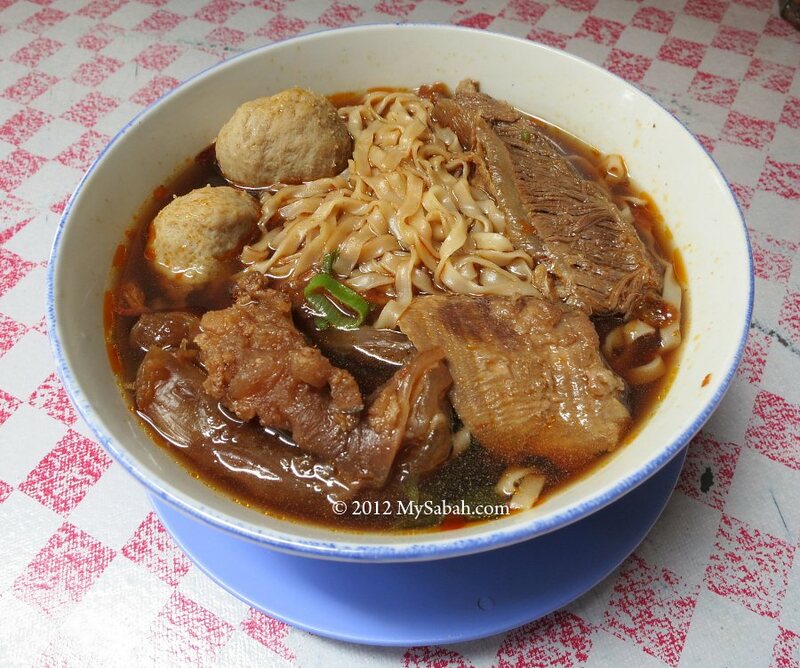 You can try their Stewed Beef Noodle (Chinese Name: 红烧牛肉面) if you don’t like spicy food. 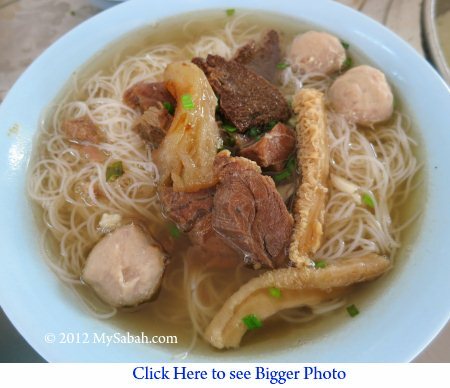 Their beef noodle only consists of meat and tendon (no internal organs such as tripe, tongue and liver like other Ngiu Chap), so I’m not sure if it is considered as Ngiu Chap, technically. Well, who cares as it tastes so good. The meat is so well-marinated that it is soft, juicy and “creamy”. The restaurant is 8 years old. The lady boss, Ms Huang, is a Taiwanese married with a Malaysian, Andrew. 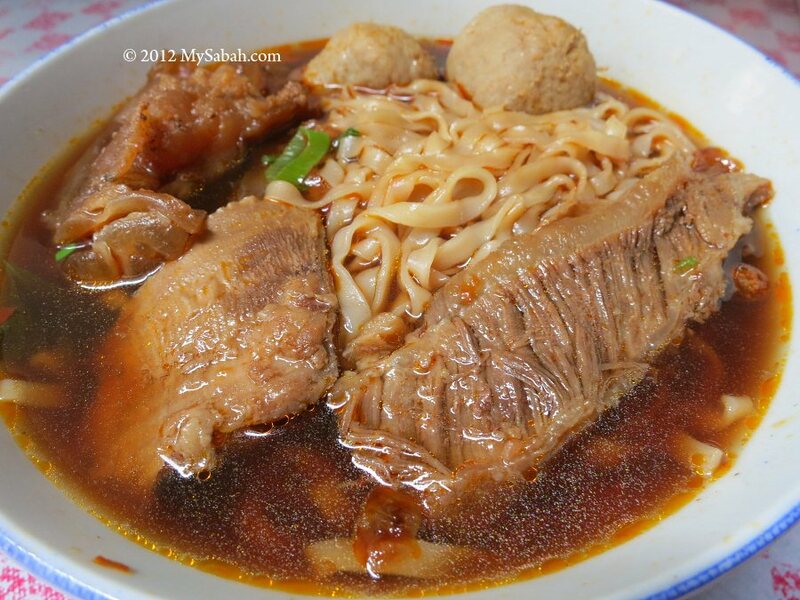 Both of them love beef noodle, so they invent a Sabah version of Taiwan Beef Noodle, or you can call it a “hybrid” of Ngiu Chap (Sabahan mixed beef noodle). 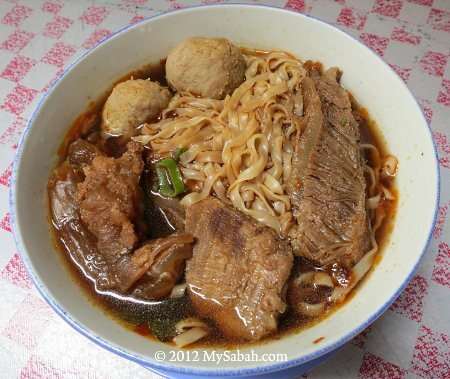 Both Spicy and Stewed Beef Noodles cost the same, MYR8 (≈USD2.66) per serving, without tendon is MYR6 (≈USD2). 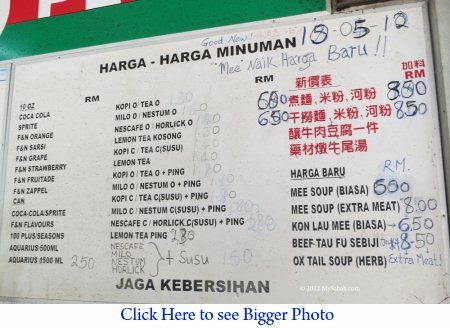 If you are a big eater and want extra meat, add another MYR3 (≈USD1). Prices as of Nov 2012. 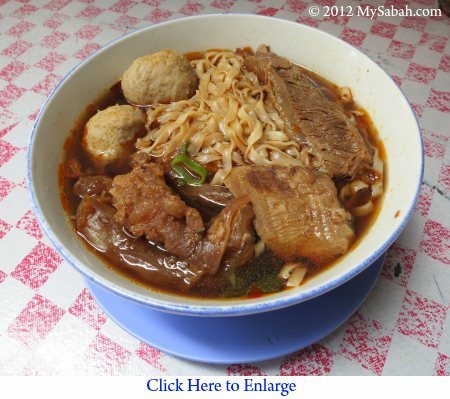 Besides Beef Noodles, their famous dish is Nyonya Asam Mix Fish Noodle Soup. This restaurant may sound new to you, but trust me, Good Luck.